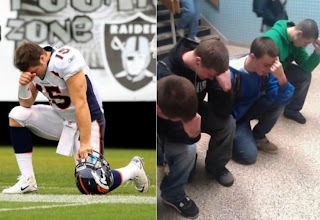 Students at a New York high school were suspended due to "Tebowing." For those of you who do not know what this is, it is an imitation of the Denver Bronco's Football player Tim Tebow's prayer pose. 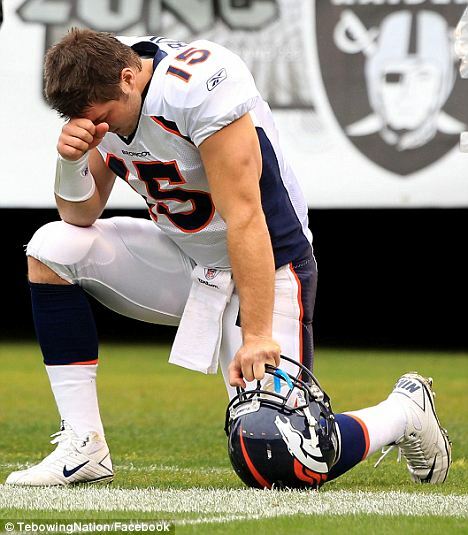 Tebow, a devote Christian often gets on one knee with a cletched hand to his forehead. He does this in order to pray and thank God for whatever happened on the field during the game. Anyhow, students at this high school made this pose in the hallways causing a crowd and were suspended. 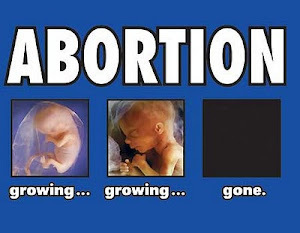 I believe the school went too far. With so many bad influences on the youth these days and bad role models in popular culture and sports, I don't see anything wrong with making a prayer stance. I understand the school's explanation of "it is a safety" issue; however, from my own experience years ago in high school I remember other students doing foolish things and causing a "traffic jam" in the halls too and they were not disciplined. The school should erase this suspension and apologize to the students and their families. Kudos to Tim Tebow for being a great witness to Christ in the sport of Football.